The Heatmiser Slimline-RF is a multi-mode wireless thermostat that is compatible with our UH8-RF and RF Switch Wireless Receivers. The Slimline-RF can be used with a remote sensor, so measuring the temperature up to 20 meters from the thermostat is possible. 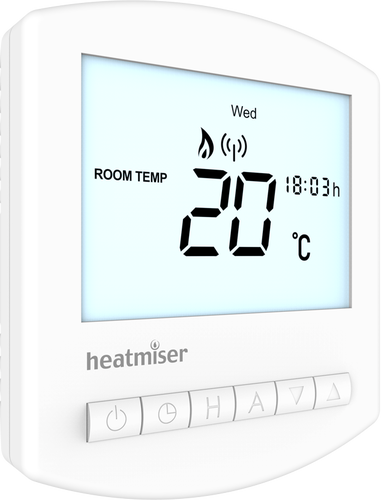 Battery Powered The Heatmiser Slimline-RF Wireless Programmable Thermostat is battery powered. Self-Learning Preheat The Wireless Thermostats feature self-learning preheat, a feature where the thermostat calculates the amount of heat up time required. Back Lit Display The Wireless Thermostats feature back lit displays. The Slimline-RF and Touch-RF have blue back lights whereas the neoAir has a white back light.